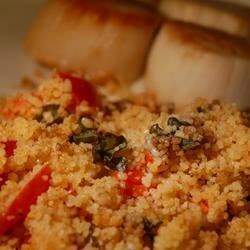 "Couscous is the best! It is fast and tastes great. This recipe is savory and goes great with chicken." Stir couscous into boiling water and return water to a boil. Cover and remove pot from heat. Let stand 5 minutes, then fluff with a fork. While the couscous is cooking, heat oil in a large skillet over medium heat. Stir in garlic, green onions and peppers; saute briefly. Stir in tomatoes, basil, cooked couscous, salt and pepper. Mix together and transfer to a 1 1/2 quart casserole dish. Splash some balsamic vinegar on top. Bake in a preheated 350 degrees F (175 degrees C) oven for 20 minutes. Sprinkle with Parmesan cheese while still warm. Excellent recipe! Very easy and healthy too...will make again!